I have been an odd combination of really lazy and super busy the past couple of weeks. I have several craft projects in the works – I’m crochetinga baby hat and blanket for a coworker, I’m thinking about doing Ravelry‘s Ravelympics, trying to finish the Anda dress from BurdaStyle, and I’m trying to recover my couch (see below). I haven’t cooked too much (I’m blaming the heat), but I’m also working on creating a weekly menu so I can do my shopping ahead of time and make something delicious each night (more on that later). I am also working on another blog (!) for my local free paper. I’m going to chronicle the transformation of my apartment, and everything related to keeping that up. Hopefully that will be as fun as I think it is going to be. That should be launching in a couple of weeks. My current roommate is moving out, and a new one is moving in. I’m sad to see the old one go, and I’m sad to see all of her belongings that I’m so used to using go as well. But at least this gives me a chance to redecorate my apartment, since she is basically moved out and the new one won’t be moved in completely until the middle of next month. So I’m planning an overhaul of the apartment – that includes the common room, my bedroom, the kitchen and the bathroom. But I’m desperately trying to do this on a budget. We’ll see how this goes. I started to draw out floor plans by hand, but this one is much more fun. 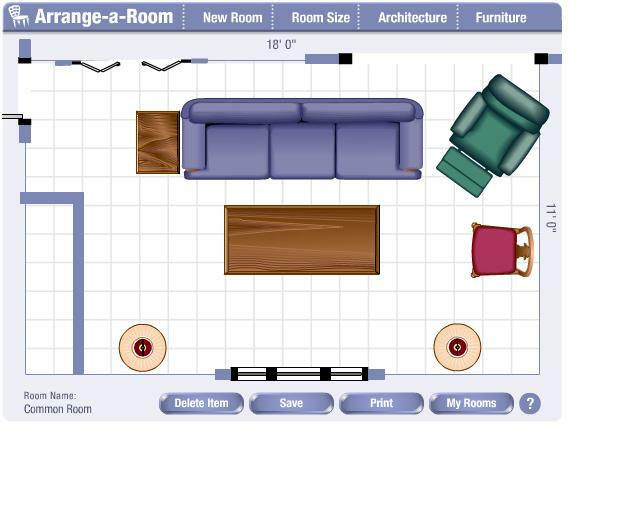 You can specify the room size by feet, so your virtual floor plan is to scale. Hope you enjoy this feature as much as I did! 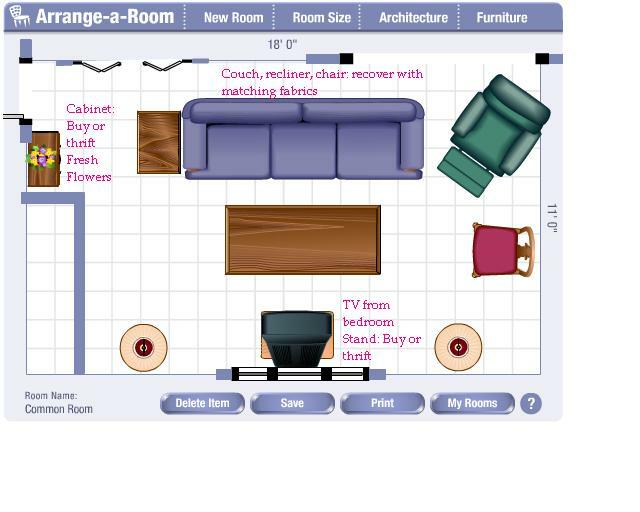 ETA: You can see my other rooms and my plans for them here. My coworker was reminiscing the other day about her father frying up some zucchini flowers with a bit of olive oil and garlic. I was intrigued, because I had never hear of such a thing, but I loved the fact that you could eat zucchini flowers. 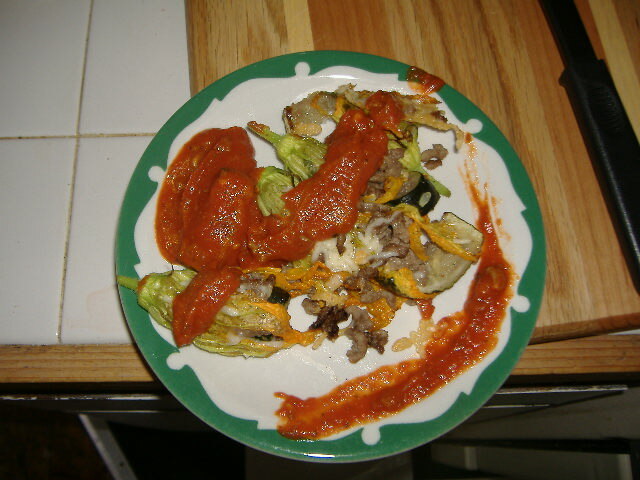 (I’m a big fan of using the most you can of both vegetables and animals.) So I was delighted to come across a vendor at the market on Saturday that was selling the flowers by themselves! 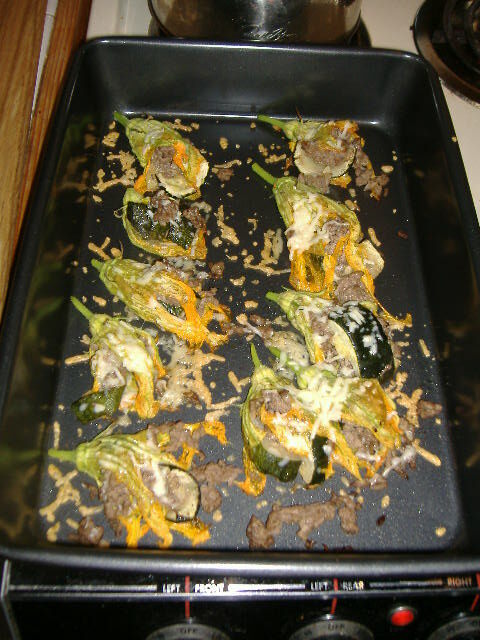 Instead of just frying them up, however, I wanted to make something with a little more sustenance, so I stuffed them, similar to stuffed peppers. 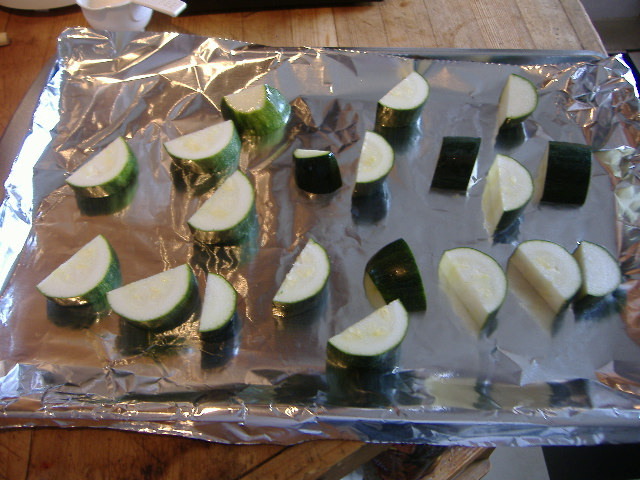 Wash and cut your zucchini in half lengthwise, then into 1/2-in. pieces. Place them on a foil lined cookie sheet and drizzle the olive oil over them. Season with salt and pepper, and broil both sides until softened and slightly browned. Put the zucchini pieces in a skillet and mash them up the best you can. 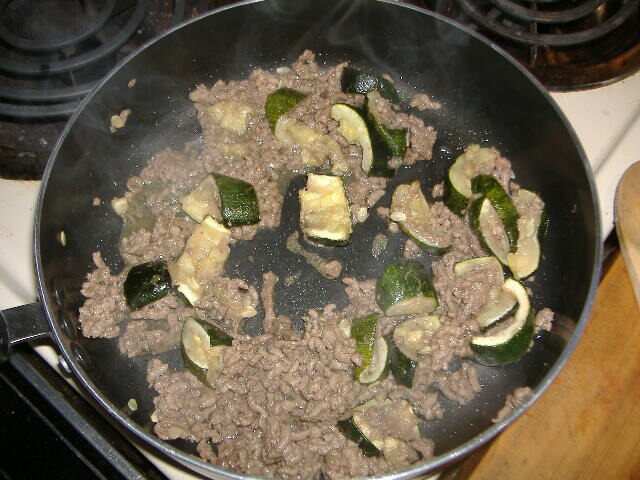 Add the ground beef and cook on medium heat until browned. 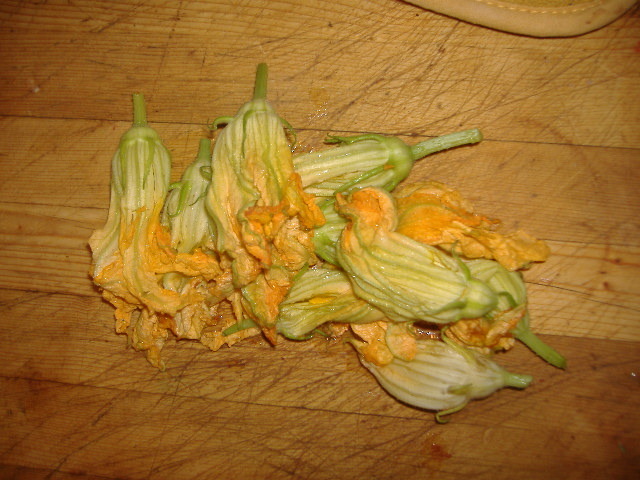 Wash the zucchini flower, both inside and out. The petals are delicate, so be gentle. You can remove the pistils and the stamens from the inside, but I let mine in. 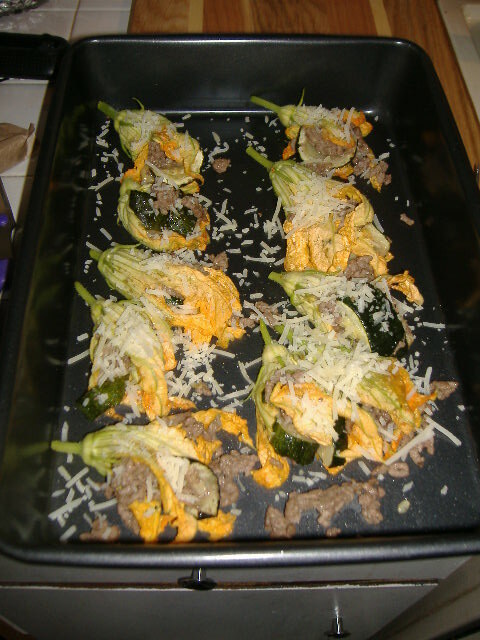 Stuff the zucchini flowers with the beef and mashed zucchini mixture. Place the stuffed flowers in a baking dish and cover each flower with the shredded cheese. Preheat the oven to 350 degrees and bake the flowers for about 10 minutes. While the stuffed flowers are baking, heat up the sauce. 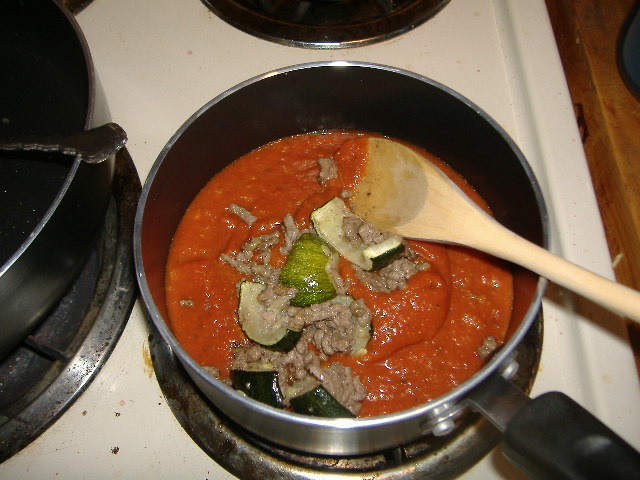 I put some leftover zucchini and ground beef in for flavoring. When the cheese is golden brown and bubbling, take the baking pan out of the oven. Serve the stuffed flowers with the marinara sauce. I thought this was a great and slightly unusual dish. There are a lot of variations you could do – I’ve read about zucchini flowers in soups, stir fries and salads. I can wait to incorporate this into my meals more often! I was shopping at the VOA the other day and I found a cute little canning jar that was made in France for $1. I bought it with no real plan in mind, other than I knew I would be able to find a use for it somehow. 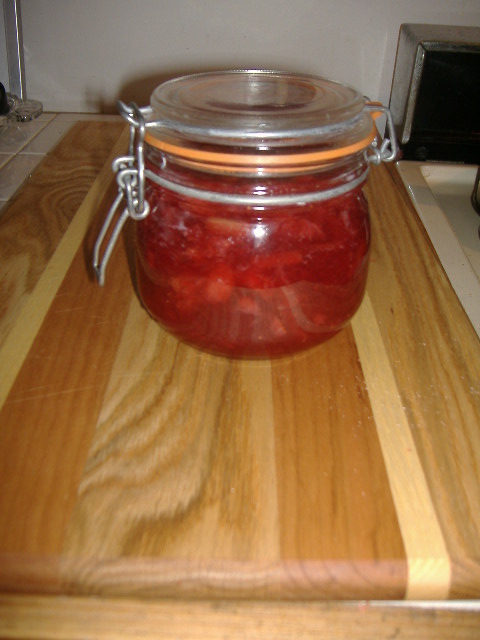 I then was reminded that I had several quarts of strawberries and a nice bunch of rhubarb from the public market that I did not want to go bad, so I decided to try a freezer jam of my favorite fruit combination. 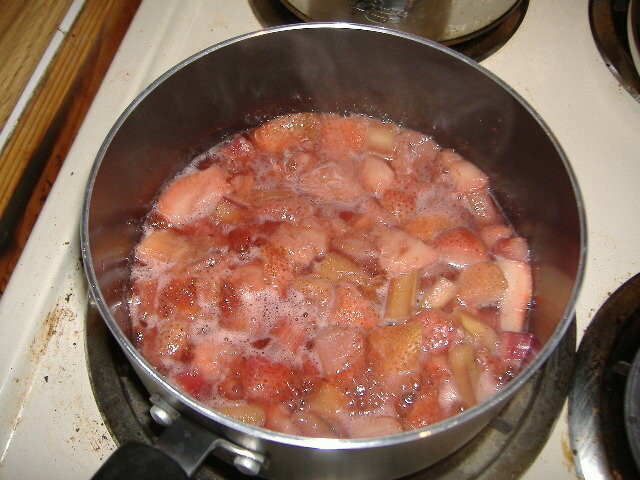 In a medium saucepan, bring the water and the fruit to a slow boil. 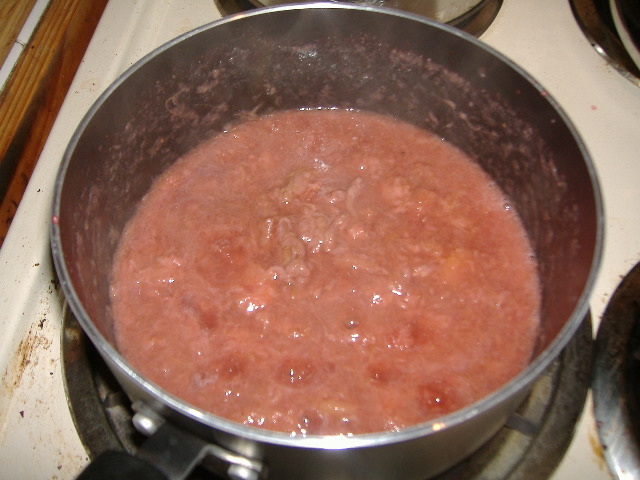 Mash the softened fruit into a puree. Stir in the sugar and bring back to a boil. 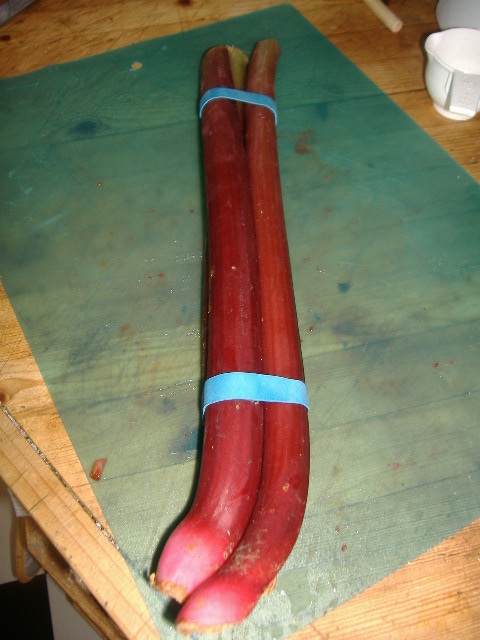 Add the packet of Jello and bring back to a boil. Stir constantly. Pour mixture into containers. Let cool and either store in the refrigerator for two weeks or in the freezer for a few months. Do not store at room temperature. I spread this on some crumpets and it was very delicious! 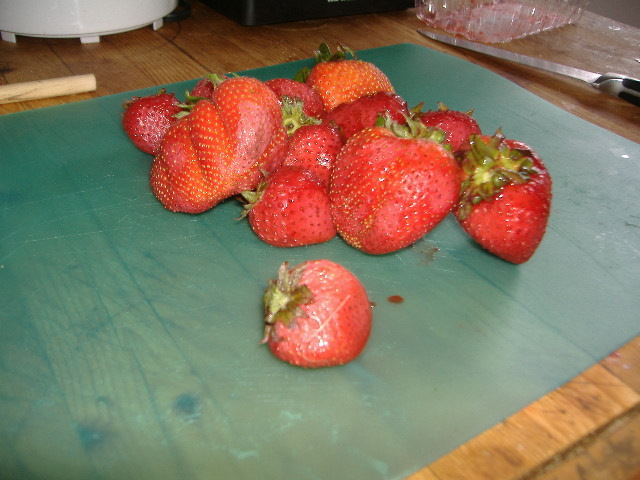 It tasted fresh, and the combination of the sweet strawberries and the tart rhubarb is amazing. This would be great on English muffins, on bagels with cream cheese, even spread over pancakes. I don’t mine is going to last much longer than a week! The boyfriend got me a cute vintage bike for our one year anniversary, so I’ve been riding it around the neighborhood. Luckily for me, my grocery store is only two miles from my house, so yesterday evening I biked down to pick up a few things. I got a nice, small watermelon that I was looking forward to enjoying that week. But when I got back to my apartment, I was pretty much dying of thirst (it was warm, and I’m a little out of shape). 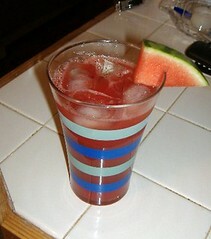 I remembered I saw a recipe for a delicious and refreshing sounding watermelonade on epicurious, so I decided to make that instead of eating it whole. Cut the watermelon into small chunks. Puree in a blender or a food processor. Place a mesh strainer over a measuring cup and pour the puree through it. I pressed the puree a bit with the back of a soup ladle to get the most juice out, but that made the watermelonade a bit pulpy. I ended up straining it twice. Pour the strained juice into a container and add the sugar and lemon juice. Mix well. Serve over ice. ETA: I just tried it with some club soda – very yummy! This combo is a little less sweet and by adding club soda, it will make your batch last longer! 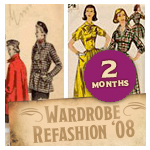 I just signed up for a 2 month stint for Wardrobe Refashion and I’m pretty excited. If you’ve ever seen my closet, you know it is crammed full of stuff – and I probably wear a good 85 – 90% of it. 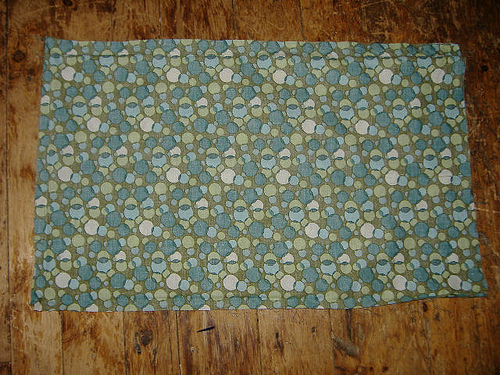 But I was hoping to reuse that last 10% to make something new, instead of spending money on new clothes. Last night I started cutting up a button-down shirt and I will hopefully be able to make a skirt out of it tonight – I will definitely be documenting everything here in detail! I , Marya, pledge that I shall abstain from the purchase of “new” manufactured items of clothing, for the period of 2 months. I pledge that I shall refashion, renovate, recycle preloved items for myself with my own hands in fabric, yarn or other medium for the term of my contract. I pledge that I will share the love and post a photo of my refashioned, renovoted, recycled, crafted or created item of clothing on the Wardrobe Refashion blog, so that others may share the joy that thy thriftiness brings! Signed Marya. I had bookmarked this craft eons ago, because I thought it looked like a cute and easy project. I turned out, when I actually had the time, that is was pretty easy, and I liked how it turned out. 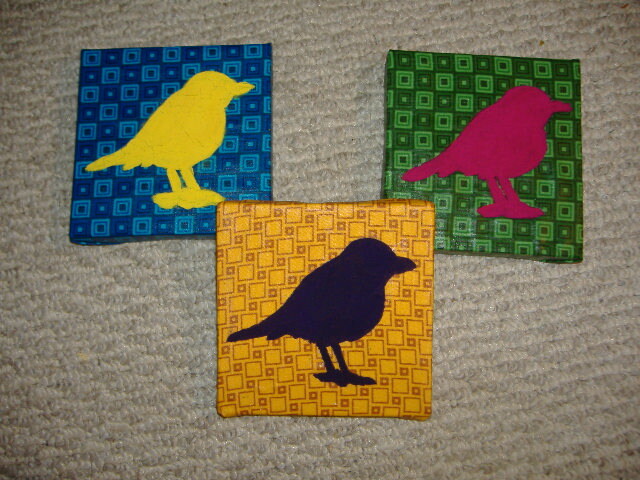 I got the fabric squares at Joann’s several months ago, when they were on sale for a dollar, so I stocked up. In the end, I think I preferred the smaller sized canvas. They look very cute together on my bedroom wall. I want to do a similar project with larger canvasses, but use actual silhouettes, along the lines of this. I’m sure it will take me another eon to get that done.